Where steamed rice is the staple food and lentils fill the protein portion, vegetables have not only enough room on the plate but also a vital role to illuminate an ordinary everyday meal. Mathematically speaking, many would agree that if rice and rasam (or saaru) were the constants, then the variable ‘palya’ (side dish) is what adds zing to the equation in a simple home-made south indian meal. 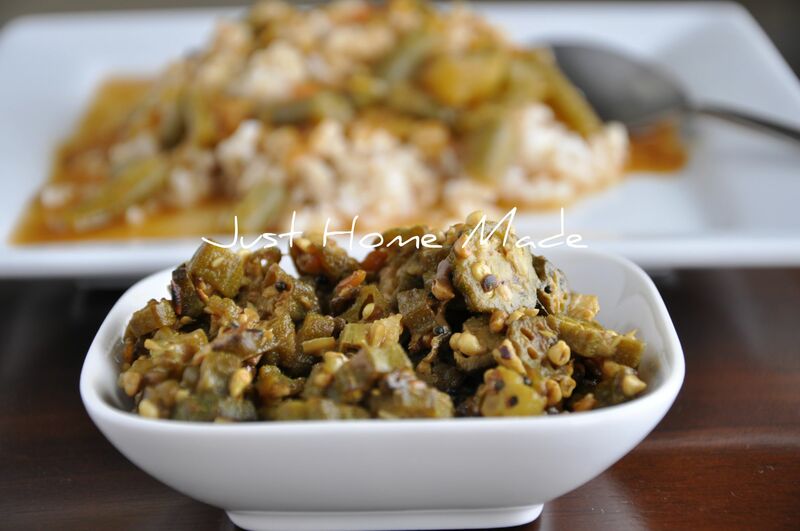 In India, okra is the queen of all vegetables and definitely my all time favorite and the recipe I am just about to tell you shares the same rapport as well with me. 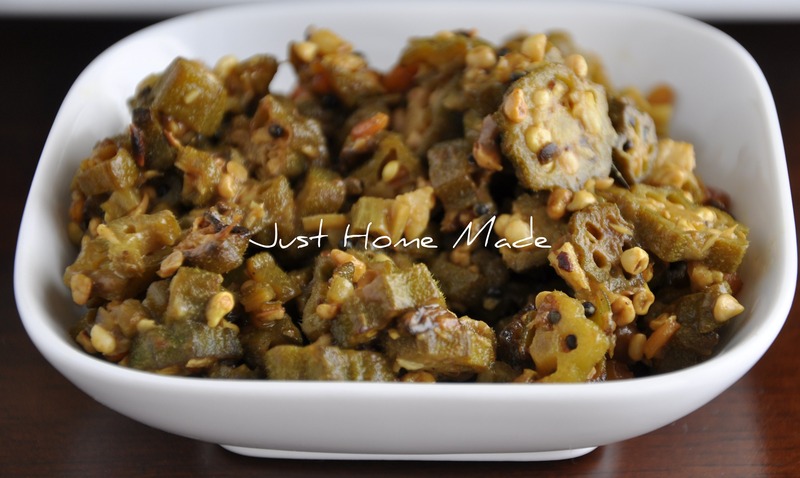 Okra and tamarind are always a couple when it comes to side-dish made mysore style, as otherwise, okra is seldom made without it. This is also of course how it has been made at home for generations of which, I could never get enough. 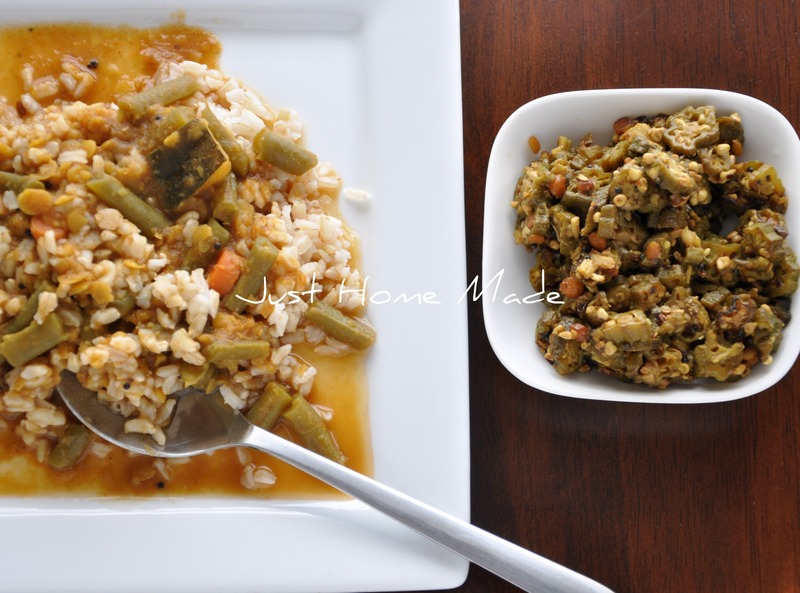 If you have always hated okra, I don’t blame you, you probably haven’t discovered the right side of it, yet. Unravelling the goodness of okra is in cooking it properly and by that I mean conquering the raw gooey-ness which we can safely leave for tamarind to do. Try it out and your opinion might change for the better, if not completely. By the way, tamarind is far removed from being exotic, it is a frequently used ingredient in almost all of everyday south indian cooking. Yes, we south indians love tickling our tangy taste buds a lot more than you can imagine! When you shop for okra, just make sure to pick only the tender ones. In Indian markets, one can even spot people snapping the pointed ends of okra to test for tenderness before it is bought. Honestly, I wouldn’t hesitate to do that before buying either. Okra it seems is very rich in folic acid. So, if you are pregnant and okra is not already part of your diet, don’t waste any time to consider adding it. Thanks to the high content of mucilage and fiber, it is an excellent laxative and helps in relieving constipation. It’s sliminess packs all the punch after all! Now, before we start, let the simplicity of this recipe not trick you to think otherwise about its taste. Place a medium-sized pan or kadai with oil in it over high heat. when the oil is hot enough add mustards seeds. When they begin to splutter, reduce heat to medium-high and add hing, chana dal, urad dal, red chillies, crushed methi seeds and turmeric in the same order and sauté until red chillies turn brownish black and/or the dals turn golden brown. Now add the sliced okra and sauté for 5-7 mins on high heat (to get rid of the stickiness) taking care not to burn them or the seasoning. Cook covered for another 5-10 mins on high heat stirring in between. Meanwhile, squish the soaked tamarind well to get a thick pulpy juice. Let it not be too runny as it will make the okra sticky again. Add the thick tamarind juice and salt, stir well and cook covered over medium-high heat until the raw-green colour of okra turns dark green. Sprinkle grated coconut, give a nice stir and let cook uncovered for another last few mins and switch off. Serve hot with either rice and rasam/saaru or chapatis. Towel drying Okra individually may seem to be a laborious task, but it helps to keep the Okra non-sticky during chopping and cooking. If the end product turns out to be too gooey, it must be to do with the tamarind juice being watery. Next time, make it more pulpy. Whenever possible choose fresh Okra over frozen ones as it is hard to get rid of the wetness from the frozen ones. this is one vgetable which i find dificult to cook. its either half done or comes out black. or even sticky. have asked many people how to exactly fry bhindis, but never got it right. Thanks to u, U have given exactly how to regulate the heat while frying. i am doing this tomorrow. have readied 1 kg of bendekayi. will let u know the result.